Ah, Boulder. As soon as you come over the hill on 36 and get the first glimpse of the city, you also get to drive past a green Suburu. This year they are a touch different, in that they have Obama stickers on them as well as “Dog is my pilot”, “My karma ran over my dogma”, and “Impeach Bush”. 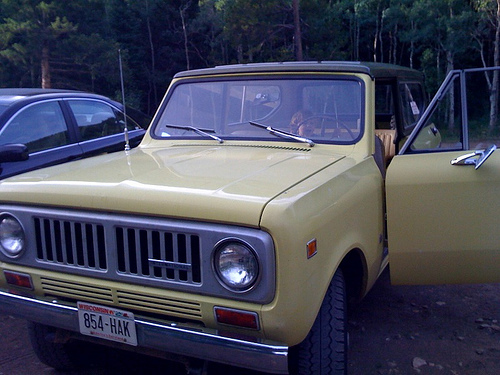 When back in Colorado, I get to drive a 1972 International Scout. Think of a Jeep that was made by a company that made tractors and the like. Oh, and it is banana yellow. It can take awhile to warm up and get started, it doesn’t handle great, and you don’t want to put your foot down in it, and these are reasons why I love it. It slows you down. The mountains slow you down. It is also interesting to think about it is a car that doesn’t have 500 computer chips in it, and you could open up Car Mechanics for Dummies and actually do something with it. As I drove the Scout to the airport I not only nodded as I had the Suburus go by, but I also saw a disproportionate number of VW Passats, just like years ago when I lived in Boulder. I remember test driving one and thinking about getting it. You know, the Audi without the price tag and the stigma. I decided against it, and turned out to be very glad as this was just when the VW plants were moved south of the border to save money. Quality tanked, and we quickly saw less and less VM Passats and Jettas, as Toyota kept on marching along.